So, allow me to introduce you to the concept of “Panta“, something entirely unknown to me up until last week. I’d say that the best way to describe it is that it’s a very simple idea around encouraging citizens to recycle their plastics by giving them an immediate reward. It’s common knowledge that in Sweden products that aren’t the most healthy are heavily taxed to discourage the public from consuming them. This goes for alcohol, fast food and even soft drinks. Coke, Lemonade, etc. However, by panta helps you get a little of that money back. On certain products that use recyclable plastic materials you’ll see a small logo with information on how much that item is worth when recycling. This Carlsberg bottle is worth 1 kr. Individually this amounts to very little, but over time you’ll find yourself with bags full of plastic bottles ready to take to your local pant station. Our closest is at our local ICA store just as you enter but they’re everywhere. The contraption is extremely simple. It values the product and tallies up your amount. Once done you can either receive a voucher of that value by pressing the green button, or donate the money directly to charities in need via the yellow. So the choice of either immediate monetary or ethical validation for recycling your old products. For me this really helps encourage the act of recycling. Back in the UK we’d pay a monthly tax to our local county council to help cover the cost of recycling services (along with lots of other things). We’d be provided with different types of rubbish bins to collect different materials, of which we’d place outside of our home on certain days to be collected. Very efficient, but not as gratifying as that immediate reward with panta. I’ve even heard stories from Maddie of when her and her brother, Marcus, were young and would argue over who’s turn it was to panta and reap the rewards. This seems common ground as you often see children getting their panta on. What are your thoughts? Are you aware of any other processes that you think are interesting? Post a comment below and let me know. Ha det bra! Have a good one! Just something else the Swedes got right over the rest of Europe, Britain in particular, then… shock horror! That 1kr you get back is actually added when you buy the bottle. 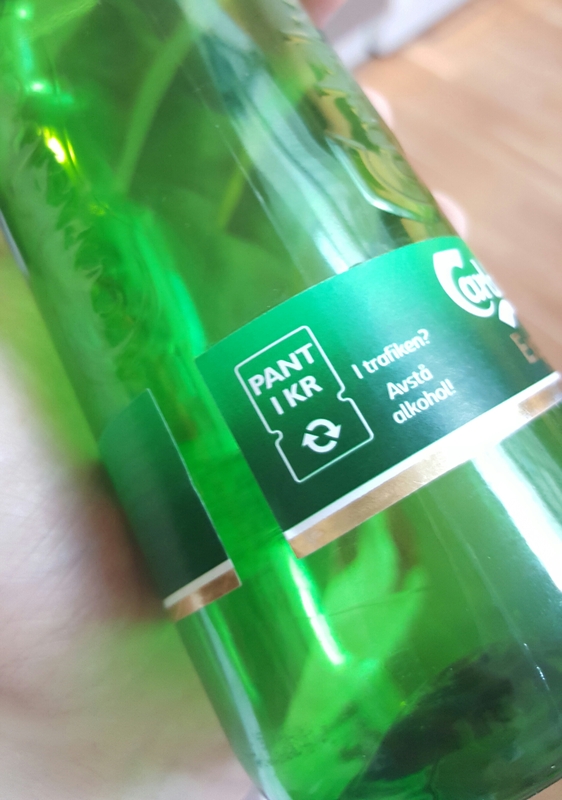 Check your receipt, it will say the price of the bottle and on the line under + pant 1kr. What’s actually happening is we hold that 1kr hostage until you return the can for recycling. But it’s true that recycling is very good for the environment and it keeps prices on packaging down. Hej Niklas. Yeah I gathered that, really smart stuff. And the transparency on the tax is just another reason to like it! It’s the same in Germany – every bottle is worth 25 cents if you get it back, which is not insignificant! And then you get money off your grocery bill. Absolutely amazing. I love it! Such a clever way of approaching the matter. Yeah that’s true I also lived in Germany the bottle is worth over 25 cents. Then they will cut the amount from your grocery bill.